I almost always include some kind of reading response in my undergraduate classes. Because I rarely use comprehensive exams for assessment, the reading responses hold students accountable for consistently engaging with assigned readings, viewings, listening assignments, and so forth. Much of the process I’m describing below grows out of my background in composition pedagogy that decenters the instructor and validates the knowledge and experience that each student brings to the classroom. We start this exercise by reviewing the “Purpose” section of the assignment sheet. 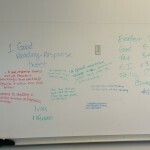 I ask students to suggest platforms for reading responses that will help them fulfill the purposes of the assignment. Generally the platforms they suggest include Twitter and some form of blog. Occasionally they also suggest other platforms, such as Tumblr and Google+ Communities. We then talk about the affordances of each suggested platform, as well as the benefits and drawbacks of using them for this particular purpose. To make the final selection, the class votes and the platform with the largest number of votes becomes the means by which we will conduct reading responses. Twitter often wins. Some might assume that this is because of the 140-character limit. So cynical! There are, in fact, lots of benefits to using Twitter. It is often already a part of students’ day-to-day lives. But not so closely engrained in their personal networks that it poses the issue of context collapse (as opposed to something like Facebook). * When we use Twitter in the classroom, students have the opportunity to communicate with the entire class (as opposed to being assigned into blog groups). The use of a hashtag means students can follow all of the class discussion without necessarily having to follow each account, again limiting context collapse. When I am teaching a grad and undergrad class on the same topic, I often use a common hashtag to allow interaction between the two populations. The act of tweeting in public** allows students to build, or add to, their public professional profile. In addition, Twitter extends the discussion to wider networks of digital media scholars and professionals, including some of the authors whom we are reading. It is not at all uncommon for a student to tweet about or to an author and have them respond. Former students often continue to contribute to the hashtag long after their class is over. Finally, Twitter affords a sort of “liveness” to their responses. The character limit is productive in that it affords brief, instinctual responses to the text. I will come back to this later. 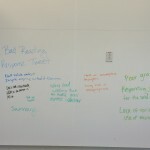 Brainstorm from S16 EMAC 4325, showing criteria for a bad reading response tweet. Our next task is to decide on the number of tweets that should be required each week. I position this as an average over the course of the semester. Some weeks they may tweet more or less. My typical grading rubric breaks everything down into “excellent,” “good,” “fair,” “needs improvement,” and “failing.” We discuss what it means to do excellent work and work that is “fair,” which is the minimally acceptable standard. Then the other numbers are easy to fill in. These correspond to letter grades, of course. However, by reframing the language we use to talk about their work, my hope is that the students will focus more on what it means to be an engaged and thoughtful member of the class, rather than fixating on the letter grade. 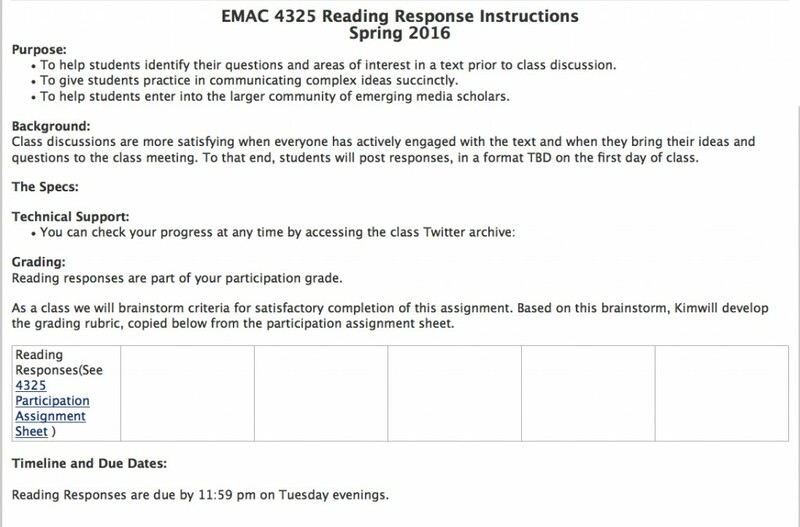 Reading Responses (See 4325 Participation Assignment Sheet) Student tweets in response to assigned readings 7-10 times per week, with the course hashtag (#digitaltext). Excellent response tweets consistently engage productively with the text(s), asking insightful questions or bringing new understandings. The student is consistently creative with the use of other media, such as images, video, and links to external content. Relevant hashtags and references to the reading (cues, page numbers, paragraph numbers, etc) are used to facilitate engagement. Student tweets in response to assigned readings 5-6 times per week, with the course hashtag (#digitaltext). Good response tweets generally engage productively with the text(s), asking insightful questions or bringing new understandings. The student is generally creative with the use of other media, such as images, video, and links to external content. Relevant hashtags and references to the reading are used to facilitate engagement. Student tweets in response to assigned readings 3-4 times per week, with the course hashtag (#digitaltext). Fair tweets consistently engage with the text, but may lack insight or fail to bring about new understandings. Other media is used in a relevant fashion. The student attempts to include relevant hashtags and references. Student tweets in response to assigned readings 1-2 times per week, with the course hashtag (#digitaltext). The student may need improvement if they over-rely on summary or engage in unconstructive responses. Hashtags may be overused or irrelevant. The tweets may lack textual cues or references. 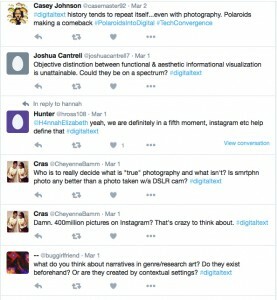 Student tweets in response to assigned readings less than once per week, with the course hashtag (#digitaltext). The student is generally considered failing if they tweet sporadically, or if the tweets are uncivil or off-topic. From my perspective as the instructor, Twitter offers certain benefits. While there is unquestionable value in the extended and reflective response that a blog format encourages, there is also something of value in the brief and “off-the-cuff” style of responding to assigned material via Twitter. I often ask the students what it would mean to think of it as “live-tweeting” their readings. In short, the “liveness” of the medium and the length constraint result in impressionistic responses to the material. Though I watch the hashtag search closely and often tweet resources and related news, I don’t respond to reading response tweets unless someone is sowing extreme confusion. I want this to be the space in which the students start to work out their own ideas about the material. Some of the most valuable activity comes from the way that Twitter allows them to fluidly interact with one another. They often respond to one another to share examples, discuss confusion, or echo their appreciation for a certain passage or argument. This also has pedagogical benefits. I can make reading responses due fairly close to when class meets, thereby giving students ample time to complete the reading assignment, while easily incorporating into my lesson plan any trends or trouble areas that I see. Reading their tweets before class allows me to “check the pulse” of the class in response to the day’s topic. Each week I use Tweetdeck’s collection feature to create a grouping of tweets to incorporate into discussion. These sometimes align with discussion points I already had planned and sometimes students introduce new perspectives that I want to bring into the discussion. I tweet a link to the collection and also put it up on the projector during discussion. I will often invite the student to expand upon the thought behind the tweet. This allows me to directly incorporate the tweets into our discussion, which also gives more reticent students a framework for joining the discussion. In terms of evaluation, there are a few tools that I find helpful. For day-to-day monitoring of the tweet stream in general, I use Tweetdeck in my browser and create a column for the class #hashtag. I add tweets to the collection throughout the week, but I am also sure to read the tweet stream after the deadline to ensure that I’m including students who might work at various times and days. 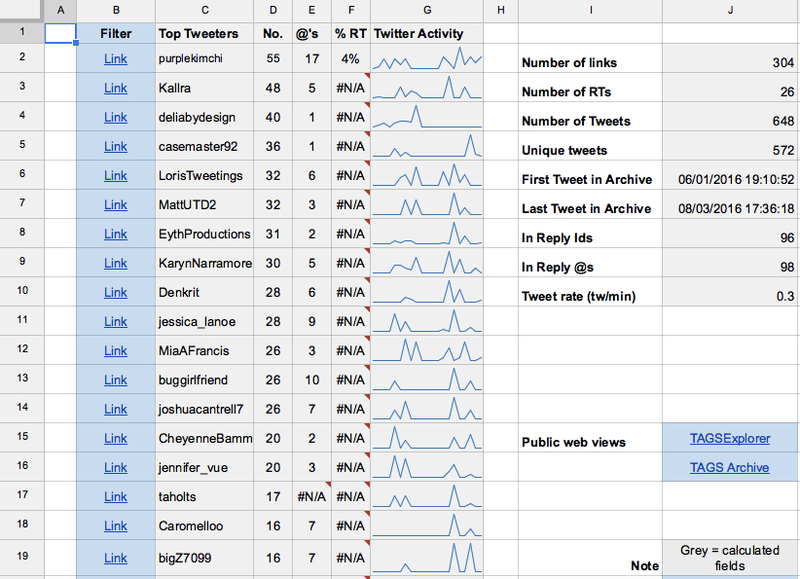 I use Martin Hawksey’s TAGS (Twitter Archiving Google Spreadsheet) tool to save the tweets and create a class archive. The TAGS tool runs periodic searches based on parameters you set up. The individual tweets are saved as entries in the spreadsheet. There is a “summary” page that can be activated to give an overview of the archive. I link to the archive on the syllabus so that students can check on their progress at any time. The archive is only as good as Twitter’s search function and for some reason, every semester there tends to be one student whose tweets never show up in the hashtag searches or the archive. The first step when this happens is to verify that the student is using a public account. If they are and the tweets are still not showing up, I instruct them to periodically download their entire Twitter archive, filter so that it only shows tweets with the class hashtag, and send that to me for evaluation. *I co-authored something about this preference: “What do They Really Think? Students’ Perceptions on Using Facebook and Twitter in Formal Higher Education Learning.” (with Jenny Wakefield, Scott J. Warren, Metta Alsobrook). In The International Journal of Social Media and Interactive Learning Environments. 1.4 (2013): 330 – 54. **Students are never required to use their real name, nor their personal account for class activities. My syllabus includes an “online identity” policy that I adapted from my former colleague and friend, Andrew Famiglietti: “This class asks students to participate in publicly accessible blogs and other forms of public writing. Writing in public has several advantages for student learning. It creates a closer analog to offline environments, and allows students to write for an external audience, instead of just an instructor. It also allows students to learn from each other. However, some students may have legitimate privacy concerns about participating in publicly accessible assignments. These students may choose to participate in public assignments under a pseudonym, or assumed name. It can be any name you choose; you need only notify me so that I know where to look for your work.